Dr. Halawi was born and raised in Tyre, Lebanon. He came to the United States on his own at age seventeen where he graduated with the highest distinction from the University of Houston. After college, Dr. Halawi completed a research fellowship in Genomics and Bioinformatics at the National Institutes of Health. He then attended Duke University School of Medicine where he was the recipient of some of the most prestigious national accolades including the Howard Hughes Medical Institute Fellowship, Jack Kent Cooke Scholarship, Paul and Daisy Soros Fellowship, Merage Foundation of the American Dream Fellowship, and the Orthopaedic Research and Education Foundation Medical Student Research Award. Dr. Halawi completed his orthopedic surgery residency at Duke University Hospital followed by a fellowship in adult reconstructive hip and knee surgery at the Cleveland Clinic. He culminated his training in the United Kingdom and Germany as the recipient of the prestigious Hip Society Maurice E. Müller Traveling Fellowship. 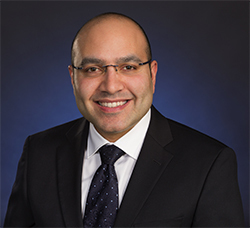 Dr. Halawi is currently an Assistant Professor at the University of Connecticut and an Attending Orthopaedic Surgeon at UConn John Dempsey Hospital. His primary interest is in joint replacement of the hip and knee. He is a strong believer in patient-centered surgery, utilizing a variety of surgical approaches, implants, and evidence-based perioperative protocols to optimize outcomes for each patient. He is skilled in minimally invasive and rapid recovery techniques, and was the first surgeon to perform same-day total hip and knee replacement at UConn Health. As a hip and knee specialist, Dr. Halawi performs complex and revision joint replacement. He is currently leading the research program for joint replacement at UConn Health where he is the principal investigator on a number of clinical and basic science studies. His clinical research focuses on improving perioperative clinical pathways to provide safer, efficient, and cost-effective care. His basic science research is focused on understanding hip mechanics and improving accuracy of implant positioning. Dr. Halawi has active research support from the Orthopaedic Research and Education Foundation and the Connecticut Institute for Clinical and Translational Science. To date, Dr. Halawi has authored over 40 orthopaedic peer-reviewed articles and book chapters. “I really cannot imagine anything better than taking a patient with severe pain and poor quality and be able to transform their lives and see them happier and functional again. …There is also nothing more intellectually satisfying than playing an active role in advancing medicine through research and training the next generations of orthopaedic surgeons” he says. The “Halawi Team” consists of four key individuals. Kim Stanowski, PA-C is a highly experienced Physician Assistant who assists Dr. Halawi in surgery and takes care of his patients while in hospital. Jill Arcari-Couture, APRN, is an advanced nurse practitioner who provides clinical care for patients not yet ready for surgery. Marita Lestini is Dr. Halawi’s certified medical assistant. Zackia Bridges brings together the entire team as Dr. Halawi’s clinical office coordinator. She handles patient scheduling, care coordination, and administrative tasks with dedication. Hip Society Maurice E. Müller European Traveling Fellowship, 2016 – 2017. Cleveland Clinic (Ohio), 2015 – 2016. Duke University Hospital (North Carolina), 2010 – 2015. Doctor of Medicine Duke University School of Medicine (North Carolina), 2006 – 2010. Howard Hughes Medical Institute (Maryland), 2008 – 2009. National Institutes of Health (Maryland), 2005 – 2006. Bachelor of Science Biochemical and Biophysical Sciences. University of Houston (Texas), 2001 – 2005.